In 1993, Joe Pope had a vision from God that Newnan, Georgia was sitting in the middle of the world and a magnificent spotlight was beaming up into the universe. The top of the light exploded into a tremendous mushroom cloud that released little droplets that looked like glowing rain. These droplets fell to the earth touching and transforming people all over the world. In Mr. Pope’s vision he observed as a man who was working in his yard was touched by a droplet of this anointed rain and was immediately saved. The man ran into his house and when his wife and children came into his presence, the same anointing fell upon them and they were immediately saved also. As the story progressed int the next day, each of the family members went about their normal daily lives. However, everyone they encountered was immediately saved through the anointing. The father, as he interacted with his co-workers, the mother as she strolled down the isle of the grocery store and the children as they walked down the halls of their school. This powerful anointing activated a domino effect rapidly spreading all over the world. Though Mr. Pope did not understand this vision at the time, he eventually came to realize that the glowing rain represented the anointed of God being transmitted through the airwaves via Christian Television. The light beaming into the universe from Newman was Glory To God Television and its programming would inspire people people all over the world to be changed and transformed by the Gospel of Jesus Christ. In 1998, with no experience or training in television production or broadcasting, he stepped out on faith to begin the journey toward realizing his God-given vision. 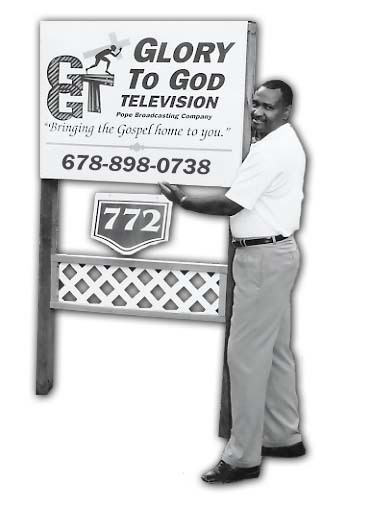 From one little VHS camcorder and one hour per day on local access to a fully staffed production office and studio broadcasting 24 hours a day, 7 days a week, Glory To God Television continues to grow and expand toward a worldwide network.